Name That Blog KRL Anniversary Contest! KRL Adoptable Cat Meet Cynn. 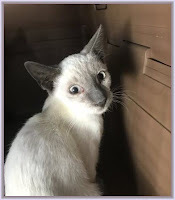 She is a 7 month old Siamese, fully vetted. Rescued from a high-kill shelter. Loves other cats, dogs, and children. Cynn is available from Feral Paws Rescue Group in Fresno. KRL Reviews & News is a participant in the Amazon Services LLC Associates Program, an affiliate advertising program designed to provide a means for sites to earn advertising fees by advertising and linking to amazon.com.